These high quality anodized aluminium, optical glass variable polarising filters reduce the amount of light entering your eyepiece. You can progressively dim the view when observing a bright object, such as the Moon or certain planets, to a level according to your needs, whilst increasing contrast, reducing glare and increasing the amount of detail that can be studied. The light transmission can be varied from 40% down to as little as 1%. The filter will not change the colour of the object being viewed and will prevent eye fatigue and loss of night vision. 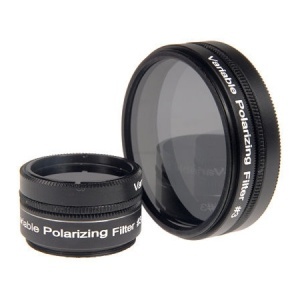 Each filter set consists of two polarizing filters, one which can be rotated in its cell to adjust the brightness. The filters, used as single elements, can also be used for daytime terrestrial use for reducing sunlight glare from lakes oceans or window glass. Available in two sizes, threaded to fit either standard 1.25” or 2” astronomical eyepieces. Supplied with storage case.